The world went Shakshuka CRAZY! Suddenly Shakshuka was showing up everywhere! The entire internet was telling me I could (and should!) make it! Ok, so maybe the world didn’t go completely crazy but I definitely noticed the dish popping up in more restaurants (e.g. Meme in the west village) and many a blog post were appearing discussing how delicious this dish was and just how to make it. Oh and one more thing happened recently. I had an abundance of eggs in my refrigerator. That was mainly due to my over excitement at making ice cream. Let’s just say I got a little ahead of myself there and needed to take a break from making ice cream after so many ice cream creations had been attempted. Therefore, many many eggs. 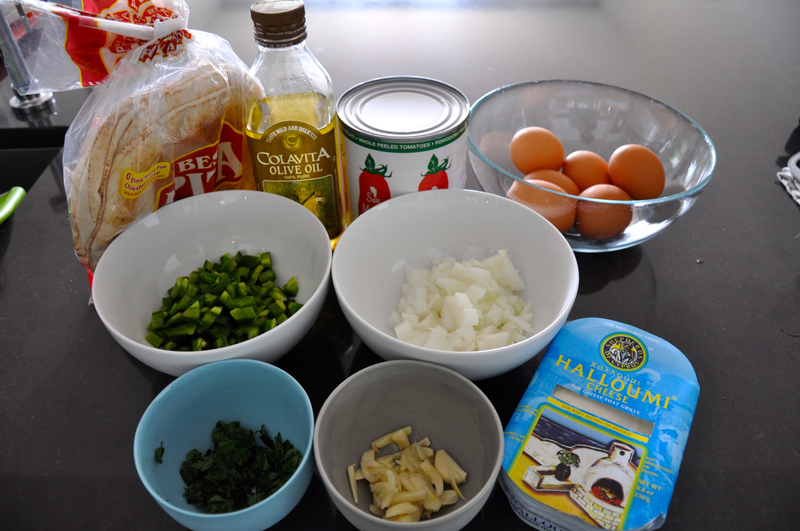 Now back to preparing Shakshuka. I basically followed Deb Perelman’s recipe on smittenkitchen almost to the letter. I opted for 3 Jalapenos and substituted Feta cheese for Haloumi cheese. An Homage to The Hummus Place I suppose. I kind of disagree with the portion size labeled on the recipe. Deb says it serves 4-6 people. I say it serves 2-3 people where each person would ideally get 2-3 eggs. Cooking the dish took a little longer for me the first time since I had some technical difficulties (more on that later) but the finished product was amazing! Delicious! Perfect! The Haloumi could have been cooked a touch longer with the eggs instead of just added on at the end but apart from that I wouldn’t have changed a thing. The cheese really does make a difference. Works really well against the spicy sauce. If you can’t find Haloumi I’m sure the Feta would work really well too. Prepare all your ingredients. Chop up onions, jalapenos etc. By the way, is it normal for your hand to feel like it’s burning up after handling Jalapenos? Maybe I did something wrong when deseeding it but I’ve never had that happen when handling other chiles… WEIRD! 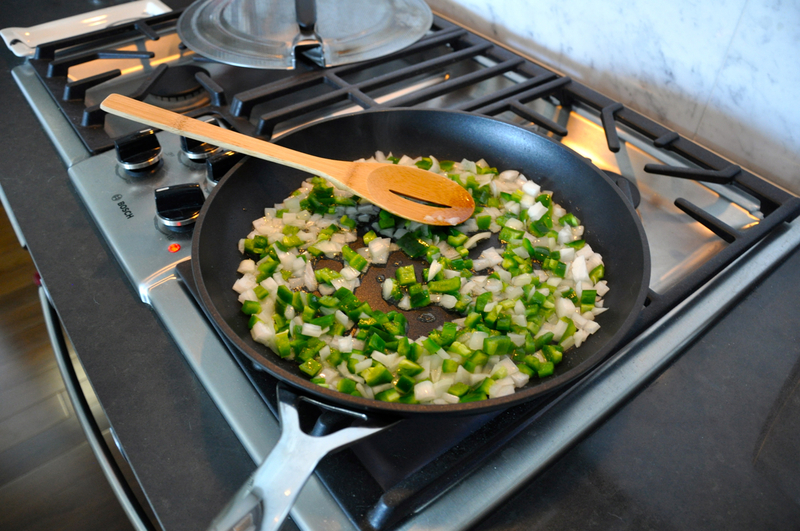 Then you cook your chiles and onions – I love my Le Creuset 12 inch frying pan for this job. Very pleased with that impulse post Christmas purchase. The quality and looks are great. It’s even dishwasher safe although cleaning it in the sink has been a breeze so far so dishwasher hasn’t been necessary. But good to know that’s an option! Then you add your garlic and spices. Time to add the tomatoes and some water! I had to mash down the tomatoes a little more once in the frying pan. Next time I’ll make sure they are well squished before adding to the pan. Time to add the eggs and then cover. Oh yes. There were some technical difficulties. 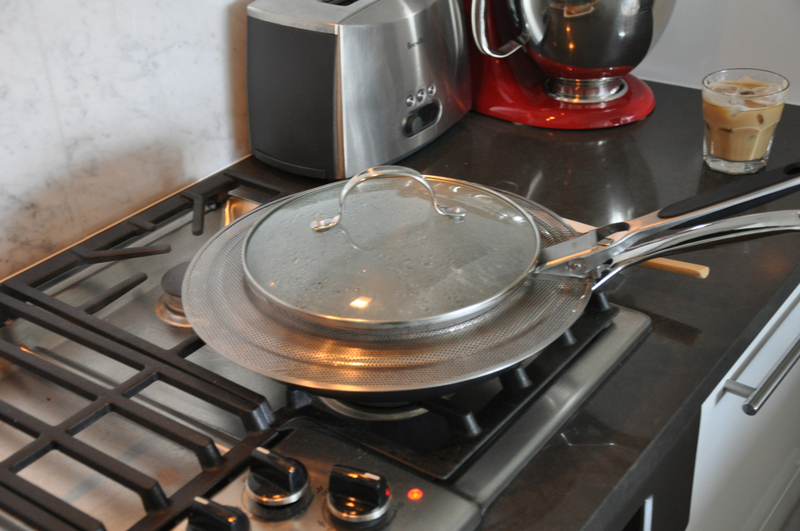 The photo below is a splatter cover with a smaller saucepan lid on top. I have since ordered an appropriately fitting lid for my frying pan. Finally I topped the cooked eggs with Haloumi cheese and some chopped flat leaf parsley. I served with some warm Pita bread and then NUM NUM NUM! Heat oil in a 12-inch frying pan over medium-high heat. 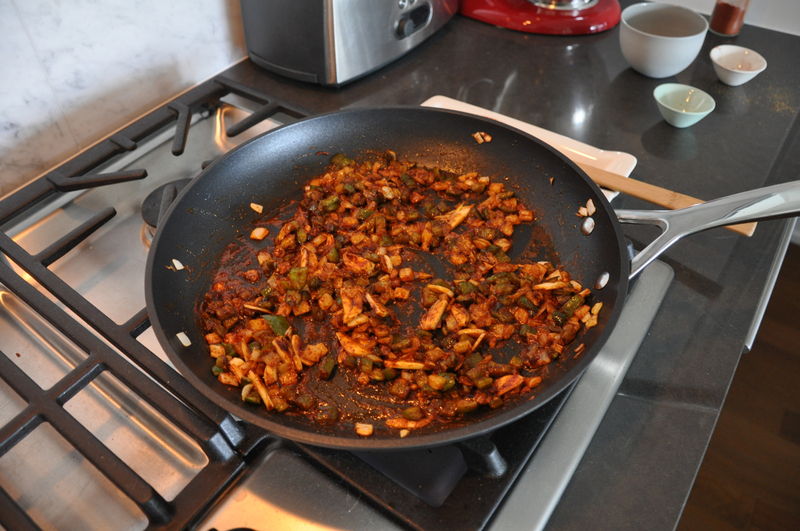 Add chiles and onions and cook, stirring occasionally, until soft and golden brown, about 6 minutes. Add sliced garlic, cumin, and paprika, and cook, stirring frequently, until the garlic is soft, about 2 more minutes. 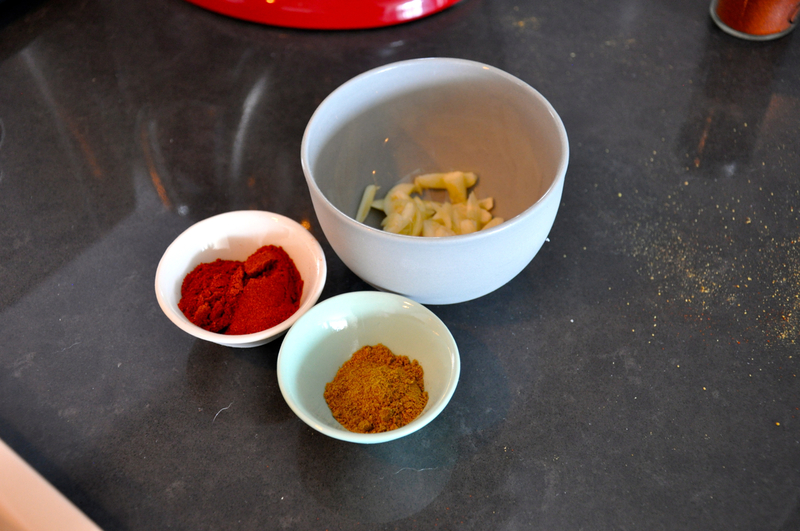 Put tomatoes and their liquid into a large bowl and crush with your hands. Now is not a good time to be wearing a white t-shirt! 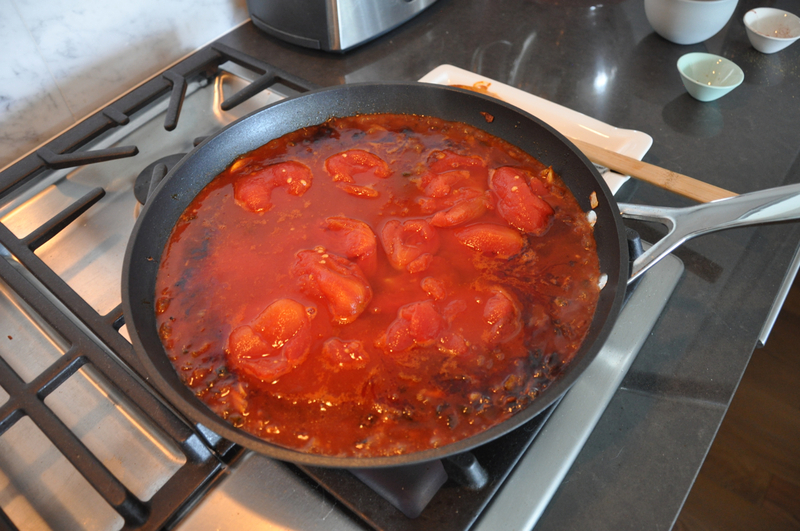 Add crushed tomatoes and their liquid to skillet along with 1/2 cup water. Reduce heat down to medium, and simmer, stirring occasionally, until thickened slightly, about 15 minutes. Season sauce with salt as per taste. Crack eggs over sauce so that eggs are evenly distributed across sauce’s surface. Cover skillet and cook until yolks are just set, about 5 minutes. 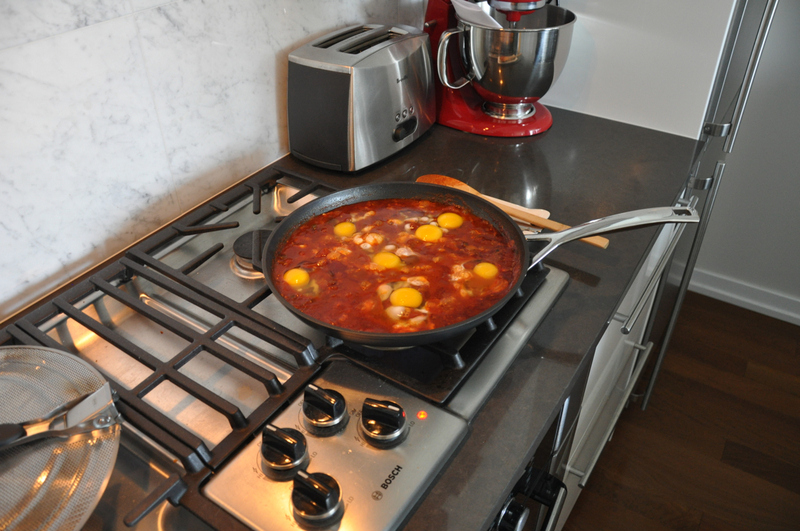 Using a spoon, baste the whites of the eggs with tomato mixture, being careful not to disturb the yolk. Sprinkle shakshuka with haloumi and parsley and serve with pitas, for dipping. Thanks Granado. Baked eggs with chorizo sounds yum! You’ll have to post a photo of the finished product.